If you are involved in criminal proceedings in Spain, even indirectly, regardless of the apparent seriousness of the case, you are likely to feel worried. This is only normal, as a criminal case can end with a conviction and a custodial sentence. It is important that you choose to be represented by professionals who understand the criminal law process in Spain so as to avoid, or at least lessen, the conviction term passed in the sentence. Spain is a popular destination for tourists who arrive in their millions every year. As would be expected many offences in varying degrees of severity are committed by foreign visitors. To make matters worse the Spanish Criminal Code is notably intricate, with arcane language and a complicated system of calculating the penalties and fines. When do I need to call a criminal solicitor? Ideally, you should call a criminal solicitor as soon as possible. Following your initial arrest you should be given the chance to make a call. However, if you are beyond this stage and have received a Court citation it is advisable to call a criminal solicitor immediately. When an offence has been committed in Spain, unless the case is extremely grave, the arrested party is ordinarily released by the police following a brief deposition before the Court authorities and allowed to go free. It is not unusual to pay a (small) fine. Since their passport is not held by the authorities, the person who was arrested or questioned can return to their home country. As they find themselves free/released, the person involved in the events tends to think that all is over and done with, particularly when they do not hear anything else from the Spanish authorities for many months. However, even when the arrested party is released it is important to call a solicitor as soon as possible because; being release does not necessarily mean that the case has been closed. Why do I need to call a solicitor in any case? You should call a solicitor even after a prompt release because it is very likely that the case will progress at Court and eventually the charges will be pushed, the accusation issued and the trial called (these entire phases take place even for minor offences). It does happen that a person who was arrested in Spain for public disorder in 2013 (for example) is released and returns home. They have forgotten the events and carried on with their life, so then in 2015 (two years later) when a citation to attend a trial against them is received it all comes as a shock. Yes, it is normal. With a legal system that is slow and carrying a big backlog, the usual time it takes for an offence to get to trial is two years. Following the first detention/arrest the file is forwarded to the Court for further investigations and to take depositions from witnesses, and other parties. Then the initially arrested parties are formally charged. After these investigations and depositions are completed, the whole file reaches the prosecutor, who will issue the bill of prosecution containing the formal accusation – normally a time to serve in prison, a fine and / or compensation for damages or injuries sustained. It is also at this point when the trial is set and all relevant parties receive summons to attend. It’s only when the aforementioned accusation is issued that the Court contacts the charged parties at the addresses provided at the time of arrest. Due to the length of time it takes for the process to reach the point of formal communications being translated and sent to the UK, it is not unheard of for years to elapse between the incident and the accused party hearing from the Spanish Court. But what will my solicitor do for me while I am in the UK before the trial? There are many things that must be done before the trial commences. A criminal case is a long and intricate process. It has two parts: the prosecutor (acting on behalf of the State) and the defence (acting for his client). The criminal process includes several stages and the work done by the defence counter attacking the evidence, witnesses, reports, and all else submitted by the prosecutor to the Judge is essential. It might in fact lead to the charges being dropped. Also, the Spanish legal system allows for settlements to be reached with the prosecutor. These are situations in which the accused can plead guilty in exchange for a reduction of the sentence. On many occasions, for instance when there is an insurmountable amount of evidence of the accused being guilty, a discussion with the prosecutor can often lead to a suspended sentence. These discussions and this settlement must be handled by an experienced criminal lawyer and usually take months. Although it doesn´t seem too relevant, on some occasions it happens that the person charged has moved house, so the citation does not reach him. This will mean an arrest warrant is issued in Spain and transmitted to the authorities in the UK. To avoid unnecessary problems, including the issue of an international arrest warrant, it is advisable to contact a Spanish Law firm with offices in the UK, as soon as possible following your released in Spain. GB Abogados will contact the Court and we can receive citations in Spain on your behalf. How will we prepare the trial? Will my solicitor be there? Our assistance in a criminal case always includes all necessary work from the moment we are appointed until the trial is held and the sentence is issued. When we supply our clients with a quote, our clear billing ensures that the fees also include preparation for the trial. It is important to note that in Spain it is mandatory that any charged party appears before the Judge to be tried and is assisted by his solicitor, so we will assist and defend you throughout the trial. What happens after the sentence? The sentence issued after the trial can be appealed. Our solicitors can review the case, make a thorough assessment, look at the options, prepare and file the appeal before the relevant Court, (normally the superior Court to that which passed the sentence). Also, in some cases there is a possibility to appeal to the Constitutional Court and to ask for a Government pardon. GB can assist and represent you in all these instances. Can you help me in any case, regardless of what the actual charges are? Yes, we can. GB specialises in Criminal Law, and as such can assist and represent clients for a wide range of offenses, from the most common (those explained below) to literally any of the possible 500 plus offenses recorded in the Spanish Criminal Act. With the second longest coastline in Europe and a famously warm climate, Spain welcomes millions of tourists each year, many of whom are young people. These circumstances and the relaxed atmosphere on the Spanish Islands tend to result in the illicit traffic in and consumption of illegal drugs of various classes. The penalties for these offences can jump easily to six (or more) years prison time even for a first time offender. Due to the volume of cases we see concerning illicit drugs we have accumulated a wealth of experience in this field. The assault of women by their spouses (boyfriends/girlfriends, partners, etc.) show such increase in numbers that specific Courts and new rules have been created in the last few years to tackle these offences and impose exemplary penalties. The Spanish legal system is, in general, very strict in relation to the crimes against The Public Administration and its representatives. It is also mandatory to carry identification (Passport or national ID card) at all times. If requested by the Police all persons must present their identifying documents immediately. Failure to comply is a punishable offence. If a person fails to present their documentation and shows any sign of distain, resistance or assaults an officer, this is considered serious contemptuous behaviour and punishable with a fine or prison. 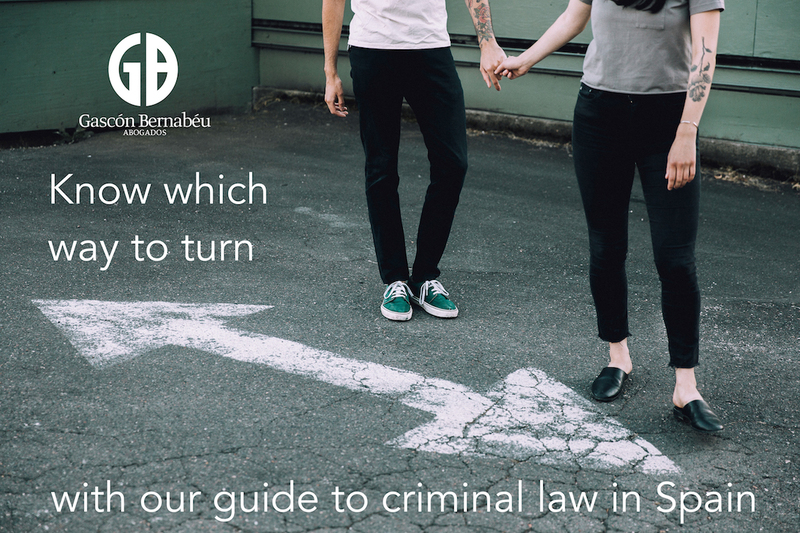 GB Abogados benefit from an experienced criminal law department, and can assist you in the previous, major, offences, as well in any other punishable by the Spanish Criminal Code. Please don’t hesitate to contact us for a no-obligation consultation.